Is LotteryBankOnline a Scam or Legit? Read Reviews! 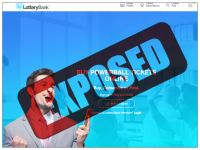 LotteryBankOnline Exposed — Are You Going to “Load Some Luck”? Clicking around online lottery provider LotteryBankOnline.com, each time you change the menu it has a ‘wait message’ of “Loading Some Luck”. At first I thought this was nice, but after a while it got darn right annoying, especially when some of the pages kept timing out. Lottery Bank is an online lottery provider for some US and Colorado lotteries to play single tickets and pools. I’m not sure if I am going to load my luck here. Lottery Bank offers six lotteries including Colorado’s Cash 5, Pick 3, Lotto, and Lucky for Life, plus the two United States big lotteries Mega Millions and Powerball. Players have the option to pick their own numbers or use quick pick. Subscriptions are also available up to one year. Sounds pretty straightforward, right? LotteryBankOnline.com has a weird slide where you choose how many games you are going to play. Plus for those that have extra options to pump up the dollar value of a potential win, you can add this. But – yes folks ‘the but’ – it makes no sense how it works. Say add the “Megaplier” to the mega millions and you choose how many tickets it is applied to. There is no info on which tickets it is added to. In fairness, it looks like the ticket costs is almost face value. They use PayPal, which means 2.9% per transaction is paid to that plus $0.30 charged for each transaction. I guess this means this is added to the ticket price as “Lottery Bank Convenience Fees” though the amount doesn’t come up until you’ve inputted your billing details. I’m still not sure what they mean by “We are reluctant to find processing fees that are not shy of 6 percent”. One of the things that looked attractive is the fact you can set up your own lottery pool or join an existing. The downside for the existing is there is no information on how many people can join. Worse, the two pools that are advertised have already expired. This does not encourage confidence. Getting your winnings at LotteryBankOnline.com is pretty straight forward. Anything under US$ 599.00 is immediately paid directly into your account. Anything over that amount, you choose what you want done, whether it is paid directly into your account or to you. I dug around Lottery Bank’s web site to try and find out whether there are any limitations on who can play here but couldn’t find anything! There is no information. Digging into the “Terms of Service”, it gets worse. There is none of the usual rules and regulations. There are no FAQs to help with this. Asking LotteryBankOnline.com doesn’t seem to help. There is only an email address – no snail mail address, no phone numbers and no live chat. There is no confirmation that they’ve actually received your email. Lottery Bank says it was started by “two brothers with a vision” but it would be nice to know how to ask them about their vision. Would you mind rating LotteryBankOnline.com? No way folks. I’m not going to play here, even if they said I could. This is a vague site with no real terms and conditions, no information on how you get your money and/or I still can’t figure out how to order specific tickets – my favorites. This site gets a thumb’s down. I forgot to mention it only has 6 lotteries and they are all in the US of A. I personally like the flexibility of following some of the other international lotteries like EuroMillions.